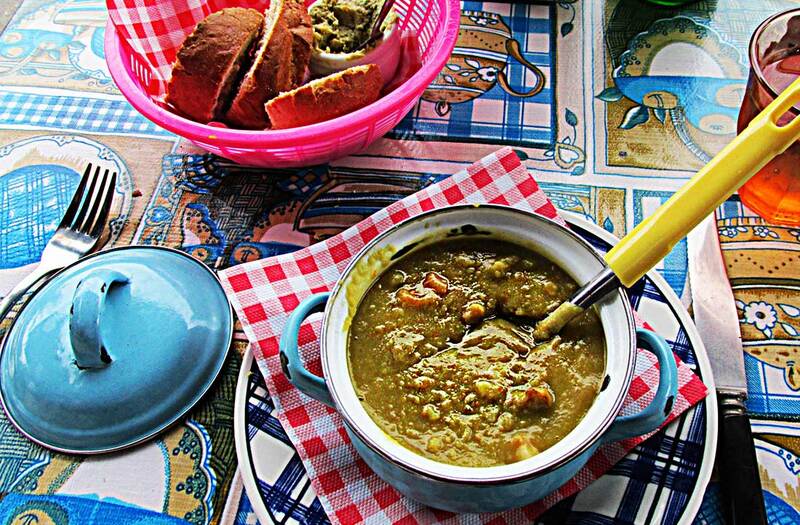 In a country not famous for gourmet food, real Dutch Pea Soup stands out as one of the Netherlands’ great contributions to the culinary world. 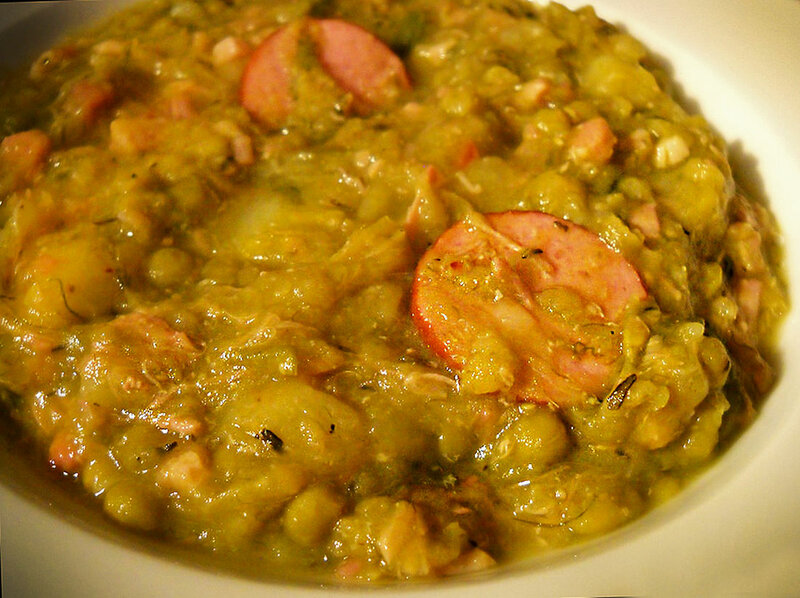 Hearty, filling, and redolent with the scents of peas and pork, of memory and home. This old family recipe takes me back to an Amsterdam apartment and a dinner table surrounded by love. 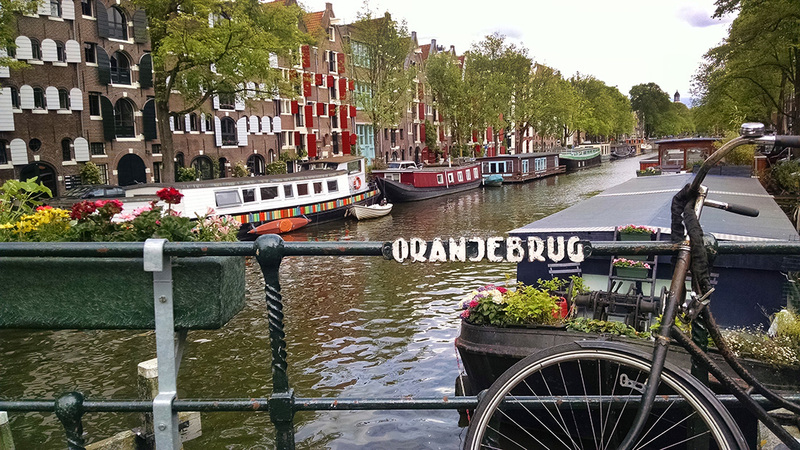 Ah, Amsterdam, you are so beautiful, especially with the green of summer and fresh flowers all around. Is it any wonder I fell in love with you all those decades ago? Many years ago, I lived in Amsterdam. Beautiful city… city of my heart. It was my first time traveling outside the US, my first time living so far from my family. I had a dream job doing what I always wanted to do, a nice place to live, and a busload of wonderful friends, both Dutch and other ex-pats. It was then I fell in love with Holland and the Dutch, a love that has never faded. When my dream job ended after several months and I could no longer afford my own place, a Dutch friend, Inez Hendriks, invited me to move in with her. It was another step in my education in “being Dutch.” Every Tuesday, Inez went home to her parents’ apartment for a family dinner. Once I moved in, I was “family” too. So of course, I was expected for Tuesday dinner as well. Mevrouw Hendriks was a good, basic home cook. One Dutch specialty after another appeared on her lace-covered table—hutspot (a one-pot meal of potatoes, carrots, onions and a smoked sausage or meatballs), stamppot (potatoes mashed with a vegetable, often kale), kibbeling (chunks of white fish breaded and fried), pork chops, sausages, stewed pears. 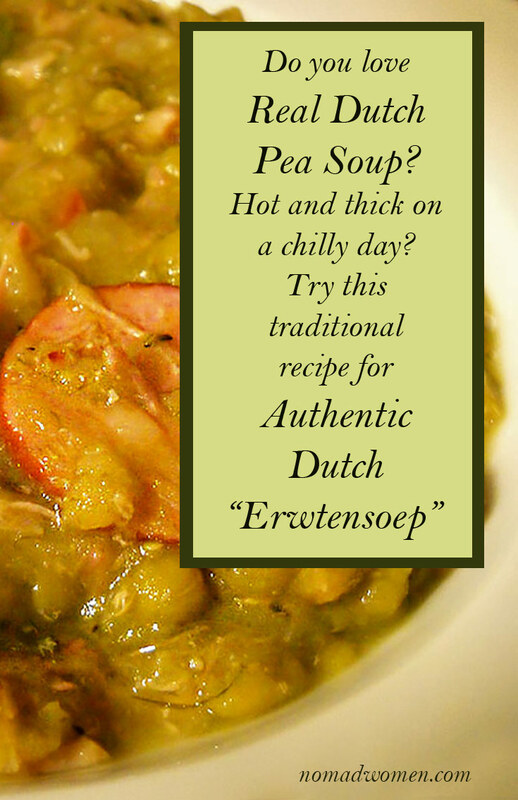 But my favorite, the one that always had me thinking “I hope… I hope…” as Inez and I strolled together along the canals toward her house, was Erwtensoep, the thick and smoky, traditional Dutch Pea Soup. It’s so much a part of Dutch family meals that it has a nickname… snert. Dutch Pea Soup had been a favorite of mine almost since the day I arrived in Amsterdam. During my days of being pretty broke, I often stopped into a workingman’s café for lunch of a steaming bowl of erwtensoep met broodje, pea soup and a soft white roll spread thick with butter. I slurped it up surrounded by Dutchmen young and old, mostly dressed in blue coveralls and wearing soft caps, hurrying to get the last drops before heading back to work. Back then, such a lunch cost less than a dollar. It was a filling and tasty meal. Some cooks add potatoes to the peas, some dump in schunks of carrot. Fancier cooks might add a few dollops of sour cream on top. But to me, Mev. Hendriks’ homey snert was the best. Always the best. Memory can play tricks on us. On recent visits, I’ve never managed to find Dutch erwtensoep in any Amsterdam restaurant with quite the same richness and depth of flavor as Mev. Hendriks’. Is it because hers was seasoned with love and a warm welcome that really did make me feel like family? Was it because it’s hard to find a restaurant in Amsterdam with a traditional tablecloth trimmed in lace, with white lace curtains at the windows, and with the perfume of Mijnheer Hendriks’ scented pipe tobacco still hanging in the air? Perhaps. Try this Dutch Pea Soup–Erwtensoep–at Moeders, in Amsterdam. It’s the closest thing I’ve found to Mev. Hendriks’ home-made snert. Served with fresh bread and a little pot of house-made hummus. I continue to search for the real thing on every trip back. The closest I’ve found is served by my favorite restaurant in Amsterdam, and it’s got just the right name: Moeders… Mothers. It offers a slightly modernized take on traditional Dutch food. It’s smallish, with tables pushed close together. The dishes and glassware are mismatched and homey, walls are lined on every side with photos of mothers… brought by years’ worth of patrons wanting to add their mom to this great altar to motherhood and mom’s cooking. See my full review of Moeders here. 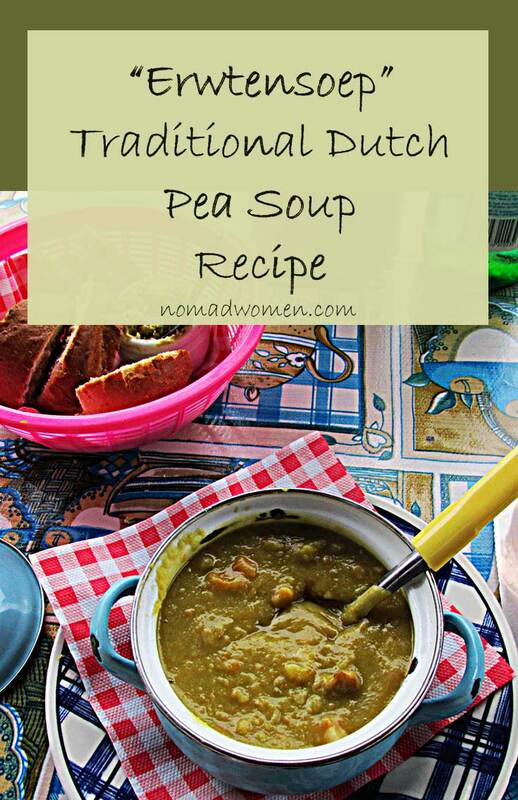 But when I want true Dutch Pea Soup, the one that brings back that cozy apartment, soft Dutch accents, and my struggles with the language, I make my own using Mev. Hendriks’ recipe. I’ve been carrying it around the world for over 45 years and through more than a dozen moves. She was a “handful of this and pinch of that” cook, so her measurements were guesses. But I’ve made this soup several times and they seem to work. The celeriac/celery root is a crucial ingredient to get the flavor true, but it may be difficult for some to find. You can substitute chopped celery hearts with the green tops and a bit of celery seed. It won’t be exact, but it will be close. Wash the peas and let them soak for a few hours. Then bring to a boil over medium heat. Add the celery root, green onions, and onion. Stir well. Let cook 1-1½ hours, stirring occasionally, until peas are soft. Add sliced pork or ham hock and the beef cutlet or ham, shredded into small pieces. Cook another 30 minutes. During the last 10 minutes, add the sliced smoked sausage. Season with salt, parsley, and a little garlic powder to taste. Serve with soft white rolls slathered with good butter. Follow Us on Social Media. We're fun and interesting--promise!